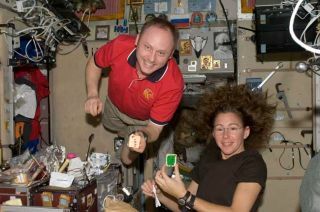 Astronauts Michael Fincke, Expedition 18 commander, and Sandra Magnus, flight engineer, hold Christmas cookies while posing for a photo near the galley in the Zvezda Service Module of the International Space Station. Astronautsaboard the International Space Station thanked the world for its concern overtheir safety following the Tuesday collision of two satellites, but said theywere confident the collision poses little risk to their spacecraft. Spacestation commander Michael Fincke of NASA told Mission Control today that hiscrew appreciated the concern and was glad to hear that the satellite collisionhas not affected the planned early-morning arrival of a newRussian cargo ship at the station on Friday. ?Weunderstand that a lot of people around the planet were worried for our healthand safety,? Fincke radioed down. ?We were touched by that and we?d like to saythank you.? Analystshave assured the station crew that the two clouds of debris created in Tuesday?scollision between a U.S. Iridium 33 communications satellite and anon-operational Russian military communications satellite dubbed Cosmos 2251 posesa relatively minor risk to the space station. The collision occurred as thetwo satellites were flying 490 miles (790 km) above Siberia. The InternationalSpace Station typically flies in a much lower orbit of about 220 miles (354 km)above Earth. ?We?ve alsobeen informed that we?re quite okay and we believe that because we?re in verygood hands,? Fincke said. NASAofficials have said that only a minor amount of debris created in the unprecedentedaccidental collision between the 1,234-pound (560-kg) Iridium 33 satelliteand Russia?s 1,984-pound (900-kg) Cosmos 2251 is expected to descend across thespace station?s orbit. Analystsand the U.S. Space Surveillance Network are keeping a close eye on the debrisclouds to determine what risk they may pose to higher unmanned satellites, suchas Earth-observation spacecraft and the Hubble Space Telescope. The risk ofsecondary collisions from the debris is relatively remote, but more time isneeded to measure the extent of the debris clouds, NASA officials told SPACE.comlate Wednesday. Meanwhile,Fincke and his space station is crew are preparing for the planned Fridayarrival of a new Russian cargo ship hauling more than 2 1/2 tons of fresh food,clothing and vital equipment to the orbiting laboratory. Theunmanned Progress 32 spacecraft launched toward the station on Tuesday and isdue to dock at the outpost?s Earth-facing Pirs docking port at 2:19 a.m. EST(0719 GMT) on Friday. It replaces an older space freighter, Progress 31, whichundocked from the space station last week and intentionally burned up in the Earth?s atmosphere on Sunday. Packedinside Progress 32 are more than 1,910 pounds (866 kg) of propellant for thespace station?s engines, 110 pounds (50 kg) of oxygen and air and 2,860 pounds(1,297 kg) of dry cargo, including food, clothing, experiment hardware andother supplies. Russian wire reports also stated that the spacecraft iscarrying a new Russian-built spacesuit. Spacestation flightengineer Sandra Magnus of NASA told SPACE.com last week that she andher crewmates also requested a fresh supply of chocolate, instant coffee and atasty Russian cream cheese-like dessert. ?It soundslike the Progress is still on schedule and we?re ready to meet it,? Fincke toldMission Control. NASAwill broadcast the docking of Progress 32 at the International Space Stationlive on NASA TV on Friday beginning at 1:30 a.m. EST (0630 GMT). Click here for a link to SPACE.com?s liveNASA TV feed and space station mission updates.